Are you tired of staring at your radar detector's power wire hanging down across your windshield and dash? This article will show you how to hardwire your radar detector for a professional looking installation. While it can be argued that radar detectors aren't 100% effective, they can serve as a warning and potentially save you from getting an expensive speeding ticket. Most people simply attach them to the inside of their windshield or set them on the dash or visor, but this leaves the power cord hanging loosely all the way down to your cigarette lighter. If you're tired of that cord getting in your way, the good news is you can hardwire it and get it out of sight for good. Keep reading and we'll walk you through the steps of a professional looking radar detector installation. First, you will need to remove the panel that contains the map light and sunglasses holder to gain access to the wiring needed to power the radar detector. Open the sunglasses holder and locate the single screw above it. Remove that screw with a Phillips head screwdriver. Remove the entire panel by pulling down on the front of it (closest point to the windshield). Figure 1. Remove the screw behind the sunglasses holder and pull the panel out. With the panel removed, you will see a wiring loom near the front of the headliner that is held in place by tape. Pull it out of the tape to gain access to the wires. Splice the positive wire from your radar detector into the green wire on the wiring loom, and the negative or ground wire into the black/white wire on the loom. Tuck the wires back into place. Figure 2. Splice the radar detector's positive and negative wires into the truck's wiring loom. 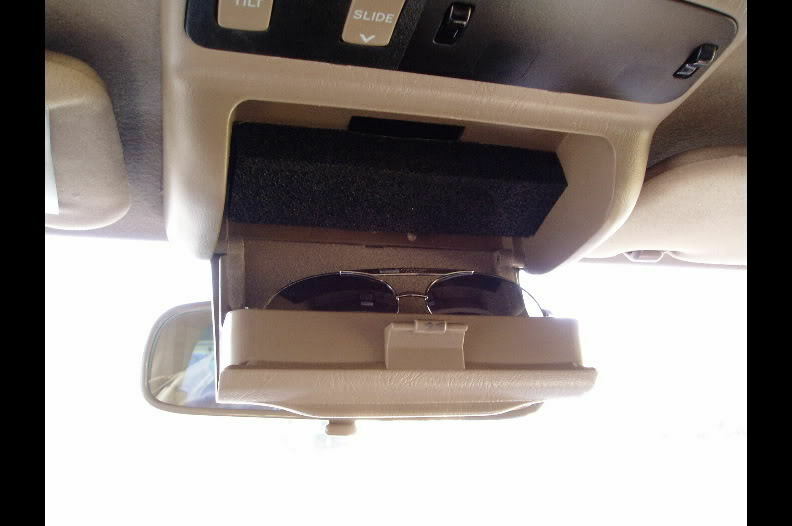 Reinstall the roof panel and replace the screw in the sunglasses holder. 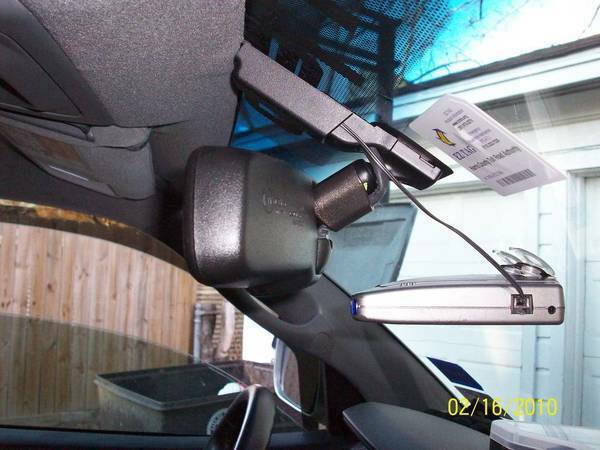 To completely hide the wire for the radar detector, run it behind the plastic piece that sits above your rearview mirror. This will allow you to mount the radar detector on the windshield while also hiding 90% of the wire. Figure 3. 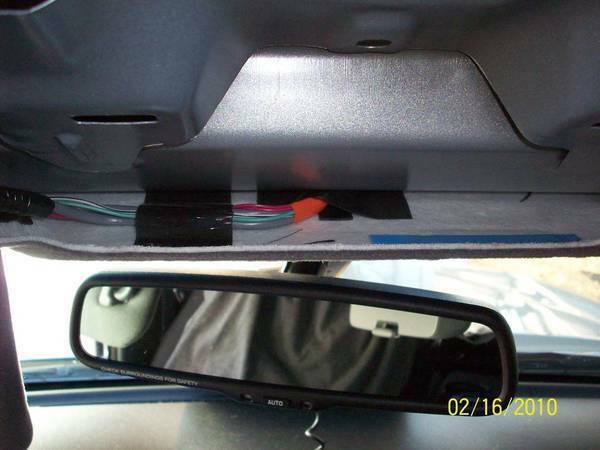 Hide the wire behind the plastic trim piece above the rearview mirror.